Paving a way to address process and asset optimization challenges and staying ahead of the transformation. RPW China 2018 setting to be stimulating and inspiring again, will be scheduled on 5-7 November 2018 in Beijing. 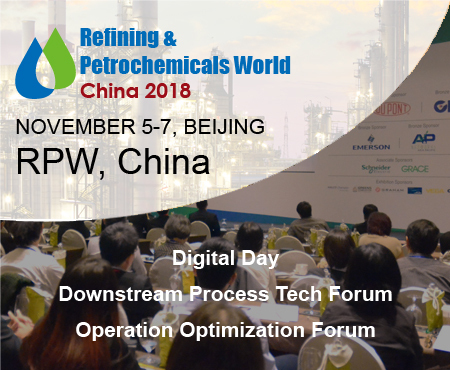 During this three-day conference, RPW China 2018 is expected to bring together 400+ decision makers and senior experts from refineries, petrochemical complexes, process & catalyst technology providers, IT & digital solution leaders, inspection & maintenance experts, and EPCs from around the world. The Conference will include Plenary Keynote Sessions, Paralleled Forums, Spotlight Panel Discussions, Fully Equipped Technology Workshops and Selected Plant Visit, which are crafted to explore complexity and trends in the Refining Technology and Operation Optimization, addressing real challenges and identifying best solutions for the industry. Contact Person : Ms Tryzzy H.